Tim has hockey in his blood and he references Roberto Luongo in his column. We should build people up rather than tearing them down. My two cents? Please apply this to social media too. You Mean You Can’t Say !@#$%^&*??? Blackhawks' Duncan Keith claims no disrespect to female reporter. Check out the link from voice talent DB Cooper. The powerful voice of the Chicago Blackhawks is Pat Foley. He was honored for thirty years of service before last night's 5-4 overtime win against Nashville. Hat tip to Adam Santic for the link! Our cat, Bunzo, might prefer a headline like Hass-Pawer? 2013 Buffalo Sabres Sports Imaging = my Verbal Fastball? The 1970 expansion cousins in the NHL just played on a Saturday afternoon. The Buffalo Sabres won, 1-0, against Philadelphia while the Vancouver Canucks lost, 4-3, in Colorado. 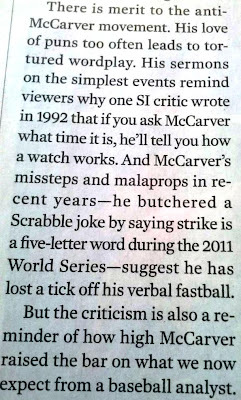 Maybe you heard me on the MSG-TV broadcast in Buffalo? 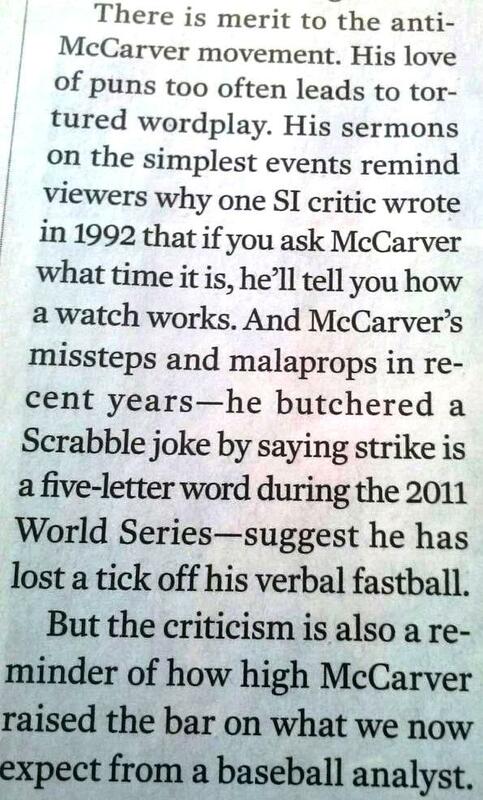 Tim McCarver's 31 year broadcast career will come to a close after he works his 24th World Series this fall. Are you a fan or not of Tim? Who do you like behind the mic for a baseball game? Seattle started strong in the series - winning the first three games against the Rockets - ALL in overtime! But in an epic comeback, the Kelowna Rockets won four straight (including overtime last night!) to advance to round two! This had happened only once in league history - when current Detroit Red Wings coach, Mike Babcock, coached Spokane in 1996. Overcoming a 3-0 playoff series deficit has never happened in the NBA and only three times in the NHL (Toronto in 1942; New York Islanders in 1975; and Philadelphia in 2010). By the way, the largest point differential overcome in the NHL playoffs was 48 - when the LA Kings beat Edmonton in the 1982 playoffs. The "David" was Daryl Evans and, of course, the "Goliath" was Gretzky!